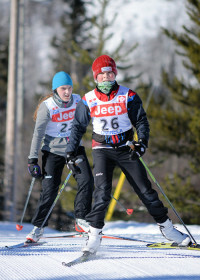 The Omineca Ski Club has developed three separate Rolls of Honour. Early Championship Racers 1927 – 1956 includes skiers of outstanding merit from the early years, before the framework for qualifications were formalized. Omineca Ski Club Roll of Honour includes skiers who have officially qualified for and competed in National and Interational Championships. British Columbia Team Members includes skiers who have officially qualified for and been nominated to the BC Team and who have actually competed for BC as a team member. Do you have a picture of any of these honorees? If so, please submit it to our photo albums page. These people are recognized as skiers of outstanding merit from the early years. These skiers officially qualified for and competed in National and International Championships. These skiers were on the British Columbia Cross Country Ski Team.